Transit couldn't have named their last album Listen and Forgive without having a lot to say. It was a record that far, far surpassed expectations for many. But this time Transit seem to be on the passive side of the conversation, fighting for words and reflectively looking to answer questions life has thrown at them. For some fans, Young New England might be taken as an album wrought with clichés. But those people have simply forgotten their youth. For others, Young New England is about connectivity, a series of snapshots capturing the times you were still young enough to feel passion, and the lessons you realized you’ve learned from those moments as you age. It was a relief for many to hear 'Nothing Lasts Forever' - the early release and first track off the album – as a sign Transit hadn’t dropped the ball for their newest follow-up. But for the track, and much of the rest of the album, it's admittedly a bit heartbreaking to not hear Joe Boynton’s vocals stretched further, for production to pull each composition and instrument in higher relief from each other. It's a trend on a few of the opening tracks, including “Second to Right” and "Sleep," despite the latter's hearty bass line and downbeat guitar forcing you to move. But don’t give up on them yet. 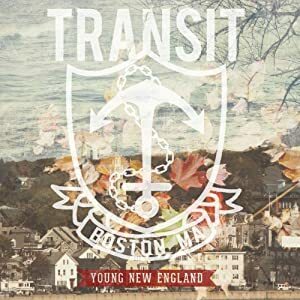 When title track 'Young New England' shatters into the speakers, it becomes clearer what this album is really about. Boynton edges onto baritone for the camaraderie of Irish Boston and booze in this ode to home. After a night of heavy drinking and a shameful blackout, Transit numbs your self-judgment and replaces it with pride. This is Boston, it’s meant to be enjoyed, and Transit will overwhelm a live crowd with this one – whether it's part of Young New England or not. They’re lyrics that take the retrospective angle at inevitable age, providing a roadmap for getting through it; 'Lake Q' does the same through an ‘80s riff and rolling drums that close out the record. But others do just the opposite, looking at youth from within the moment in an effort of preservation. 'Don’t Go, Don’t Stray' is one of those tracks, a picturesque moment outside without a care except to make sure this instant lasts as long as possible with the person they’re with. It’s a picture of a summer’s day that could easily coincide with 'Summer, Me,' a pop track with a few more moments of the typical themes of aging and wasting away with friends. Despite the redundancy, there’s one moment in this song that could be the most beautiful on the entire record: “I hear the radio singing songs that we knew/the ones my mother fell in love to.” The song – whether you’ll classify it as cliché or not – glorifies the undeniable, shared human experience. It’s not college acceptance letters or promotions or paychecks that connect us, it’s friends and love and music. Transit fans have already shown mixed feelings about this record. Whether songs about growing up and love are cliché or a sign of maturity, the band have clearly laid down their anger and intensity heard on previous albums, replacing it with acceptance, retrospect and wisdom. And while Young New England may not have such a directness as Listen and Forgive has, the newest release is less about personal quarrels and more about collective experience. Admittedly, I didn’t quite understand this record the first few times I listened to it. But a chance ride on the Boston T (subway) at the same moment Transit's recent Hard Rock Cafe listening party let out, with a bunch of sweaty kids gripping their new Young New England records and merch crowding the train, forced a little more appreciation for what this release means. Everyone will feel the way this record sounds; we’ll all learn lessons the hard way, but it’s better to know you’re not alone. Young New England is available now via Rise Records.